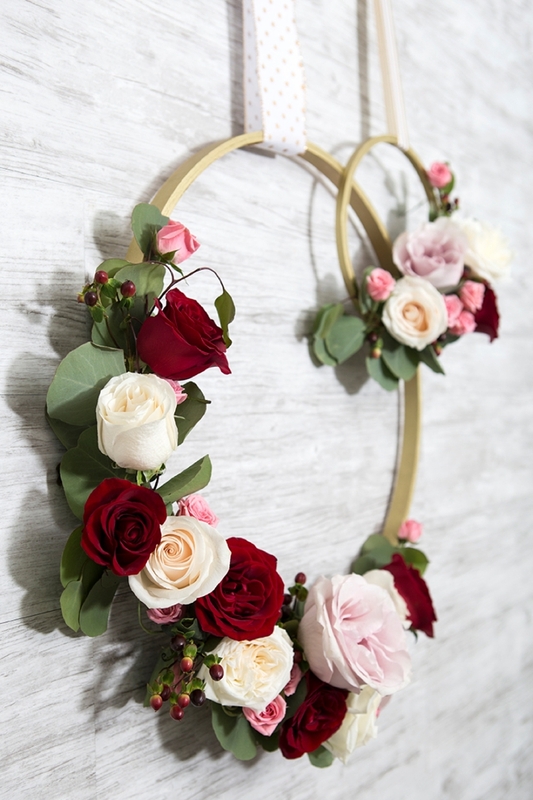 WOW, These DIY Floral Hoops Are Simply Gorgeous! 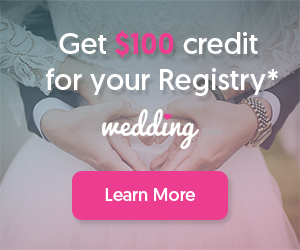 You might remember our Flower Power features with FiftyFlowers.com from last year, where we shared detailed information on popular blooms and how to use them in your wedding and events. 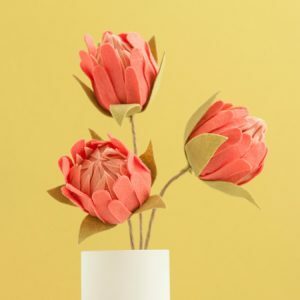 This year I’m excited to share that we’re going to be taking a deep dive into everything DIY Flower and today is our first feature! 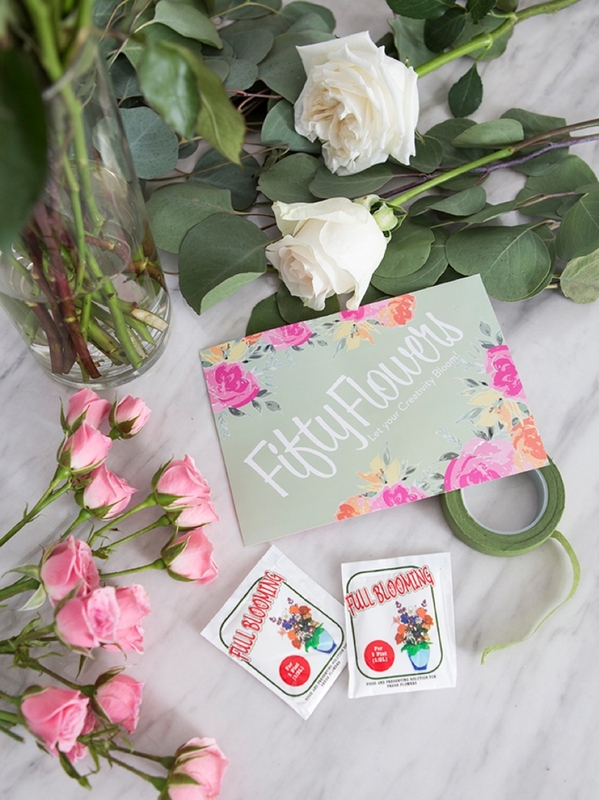 FiftyFlowers DIY Flower Combo Packs is what inspired this idea as they are thoughtfully curated collections of flowers and foliage, perfect for the DIY bride. 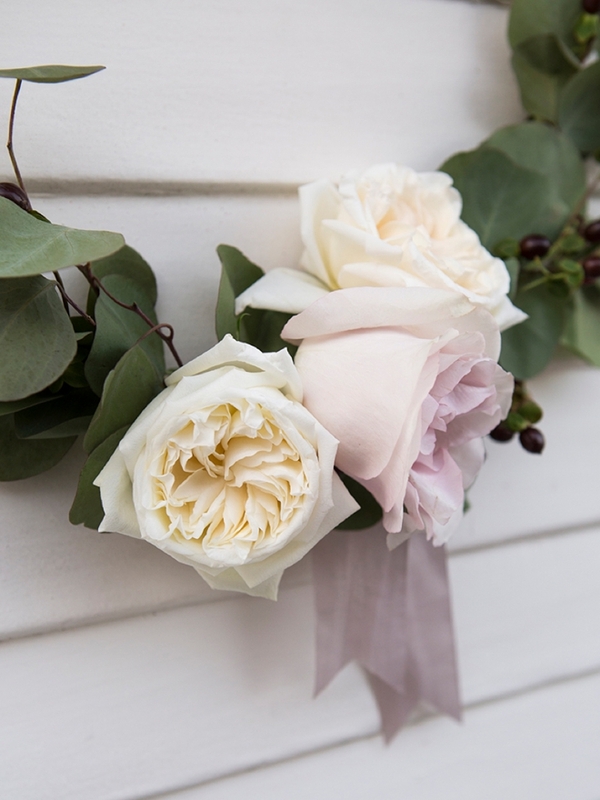 My good friend Jaqueline is a currently retired, extremely talented florist, you might remember her from our Bouquet Blueprint features and she’s going to be helping me on each project. 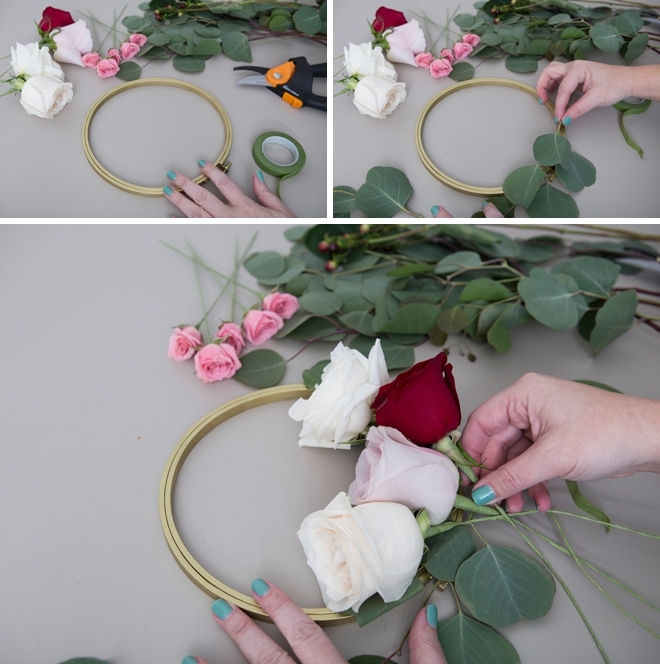 First up, how to create the most beautiful floral hoops that would make lovely wedding or bridal shower decor. 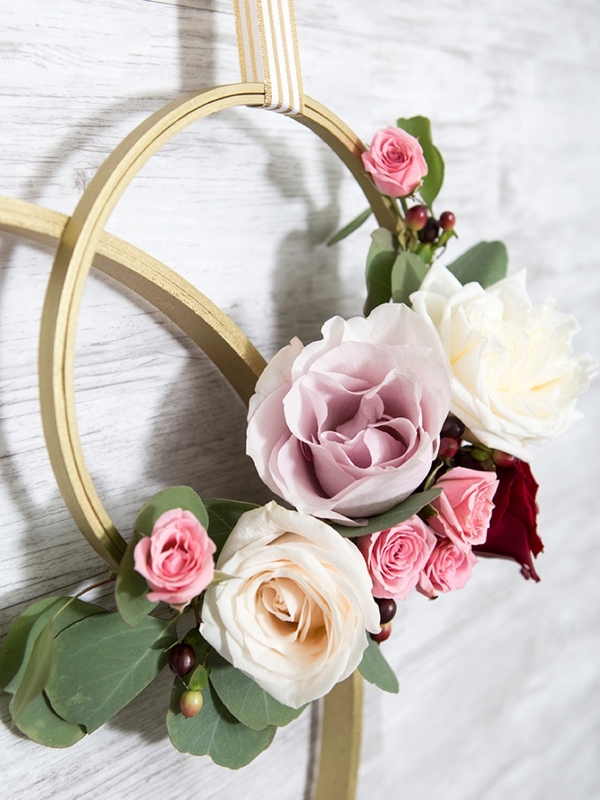 From a large ceremony backdrop display to hanging on the entry door to your bridal shower, hang these gorgeous hoops where ever you see fit! 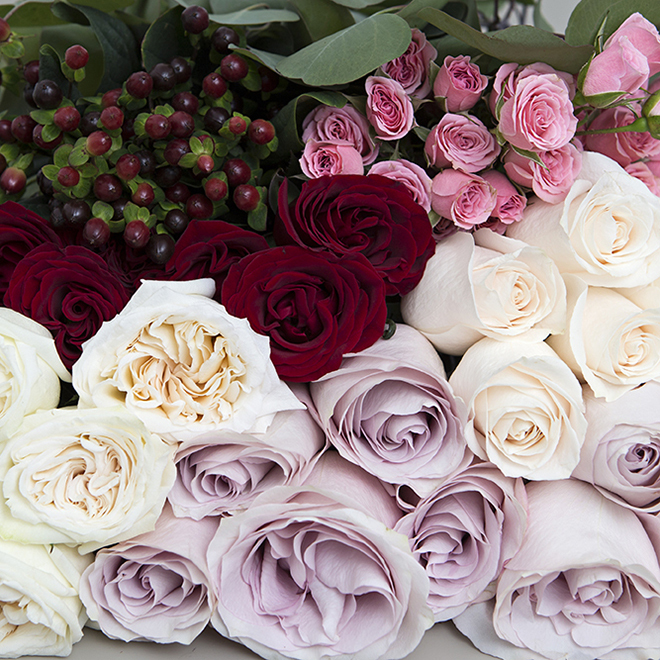 Since these blooms will have NO water source, they will look their best for only 36 hours. 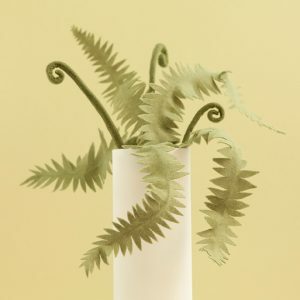 After that, they will naturally wilt and die… so keep that in mind when you are making your plan to assemble them. Again, since these flowers come straight from the farm, they will still have their leaves and thorns. 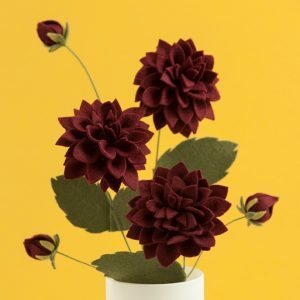 The process to clean each flower is different, refer to the instructions. 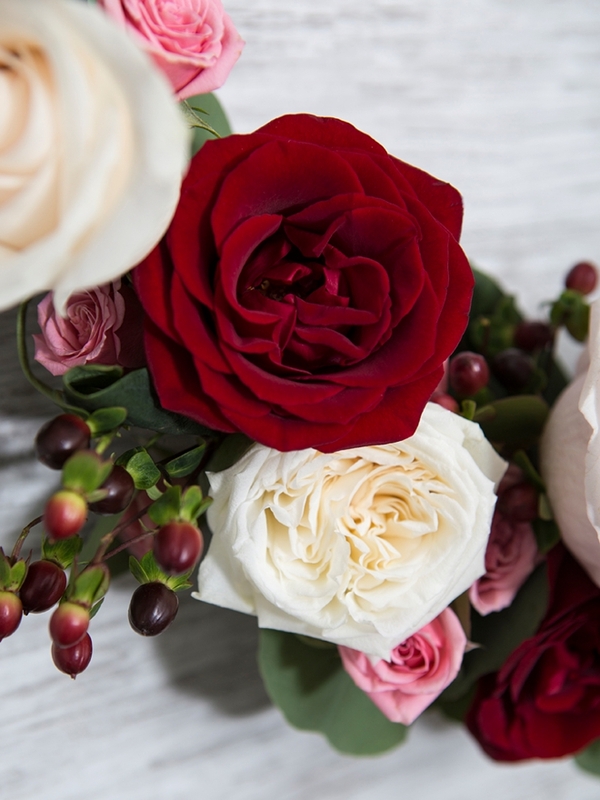 For the roses that come in this variety pack you’ll want to remove all the thorns and leaves with a floral knife and add a slanted cut to the end of the stem. You’ll also need to remove 3-5 guard petals. Place in fresh water until you’re ready to start creating your hoops! This was my first time handing off the “step” to someone else and I played photographer! Here Jacki is wiring a rose. 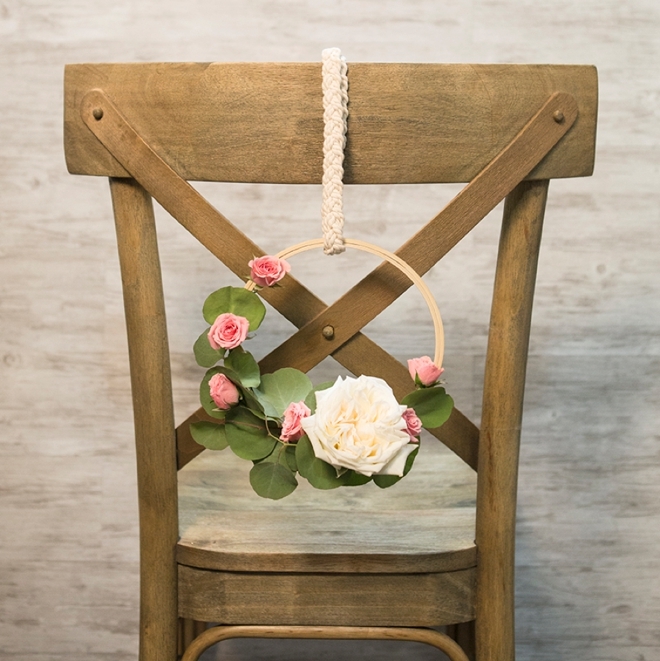 This adds stability, holds in moisture and provides a wire base for adhering to the hoop. 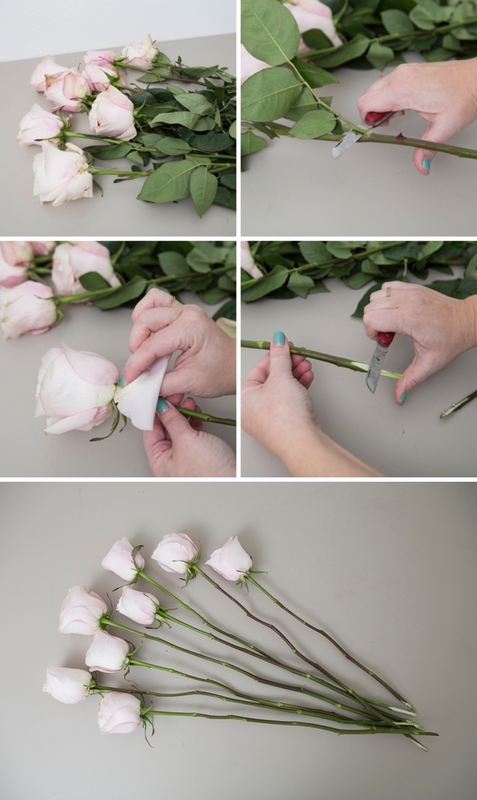 Cut the stem off the rose leaving about a 3/4″ stem nub. 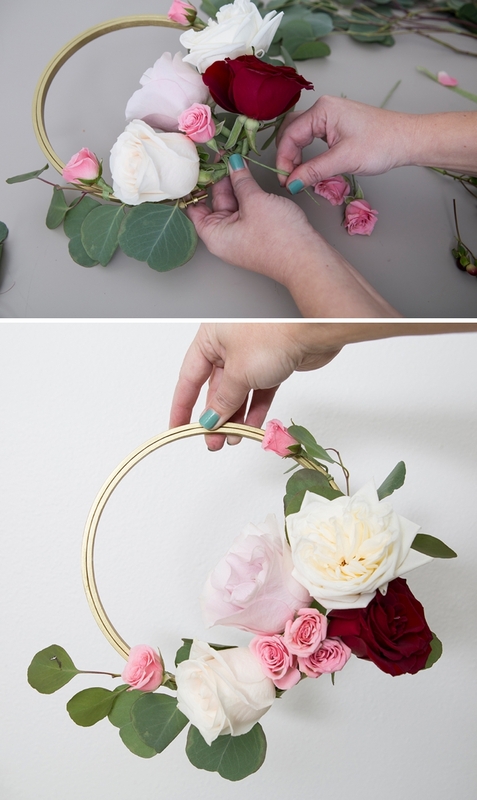 Insert a floral wire through the base of the stem. Thread the wire through about 4″-5″ then bend to meet the other end of the wire. 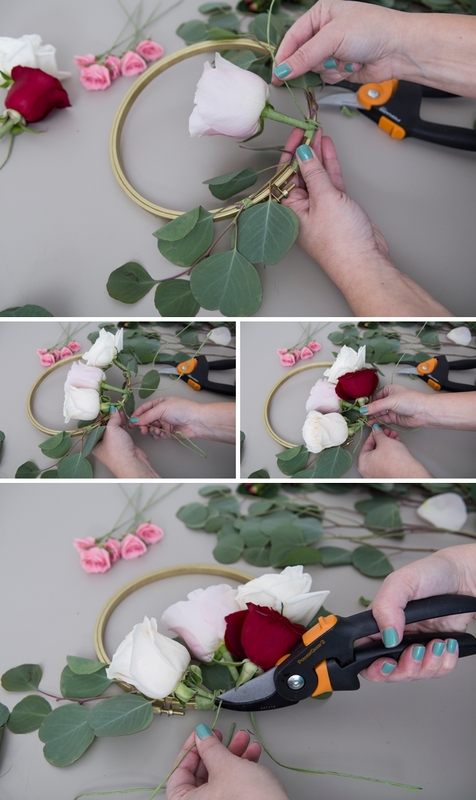 Starting at the base of the stem, wrap the entire length of wire in floral tape. 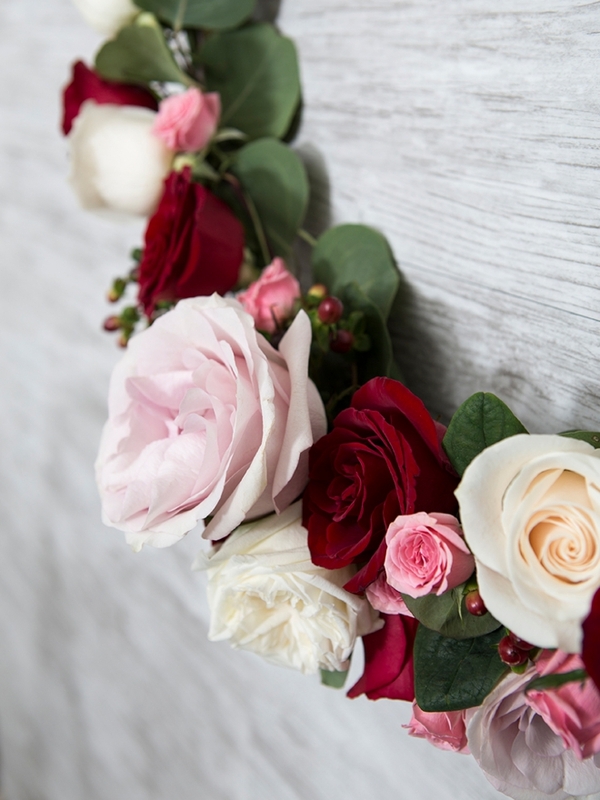 The way to activate floral tape and make it sticky is to pull it! 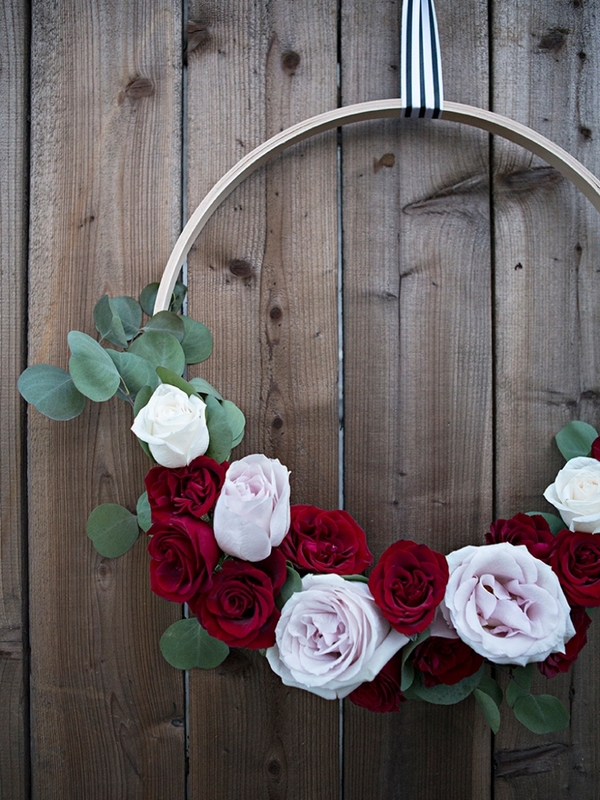 Do this for all the roses you plan on using for the hoops. 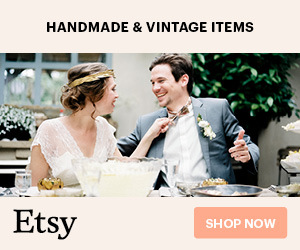 No need to do it for the berries or eucalyptus. 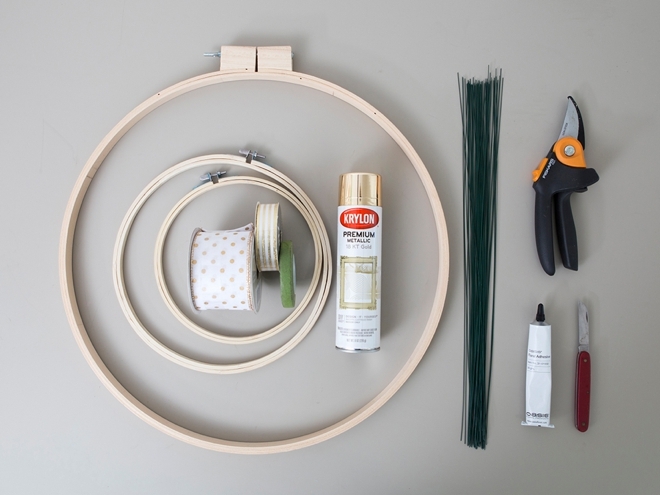 Spray painting your wooden hoops is totally optional! 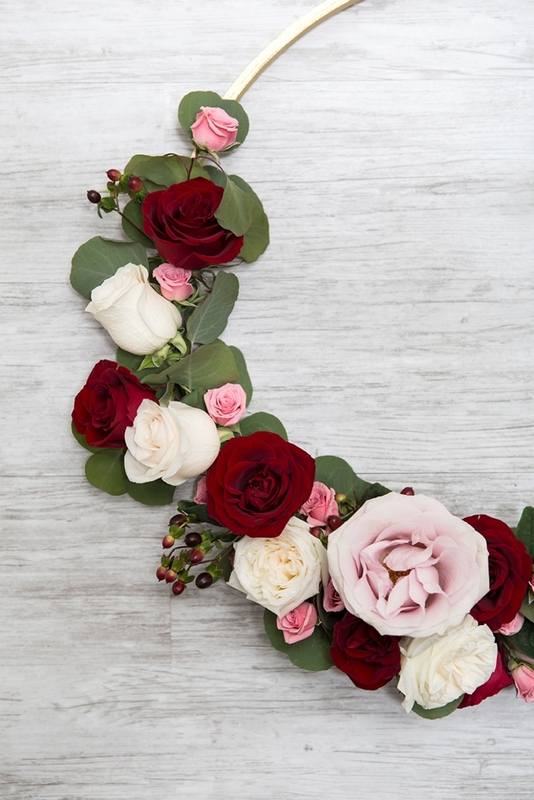 Look at the different flower combinations and layouts we created here and come up with your own! 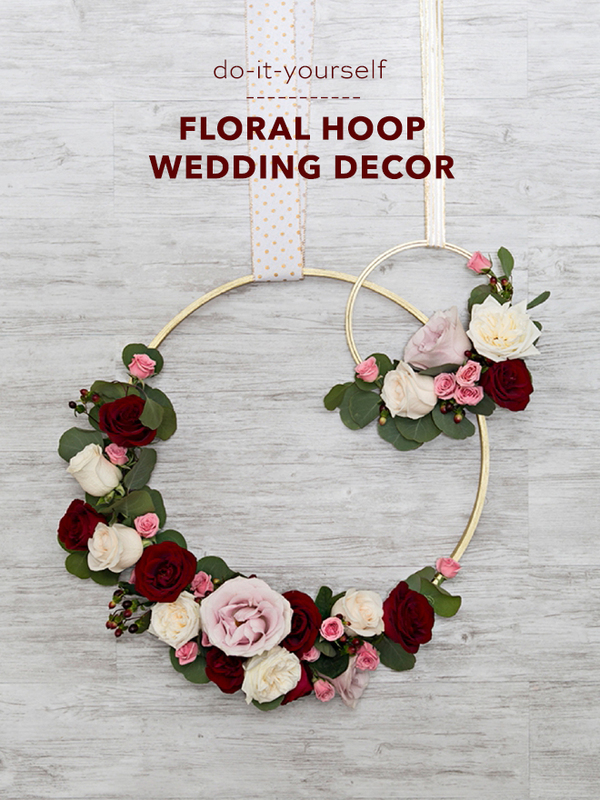 Lay the flowers out on your hoop first and create a plan before you start assembling. 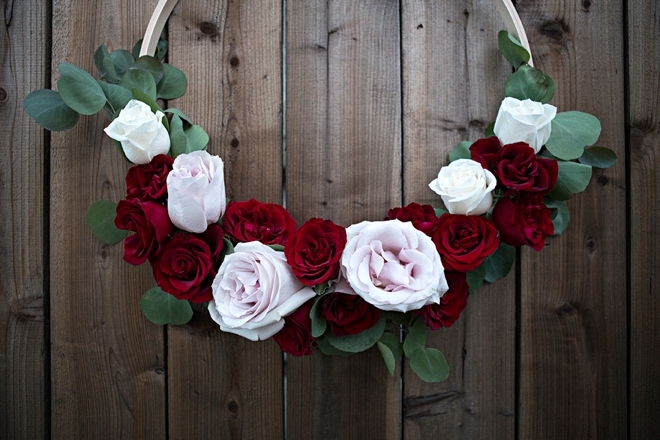 Add the largest roses or flowers first and then slowly fill in with the rest, by wrapping the wires around the hoop. 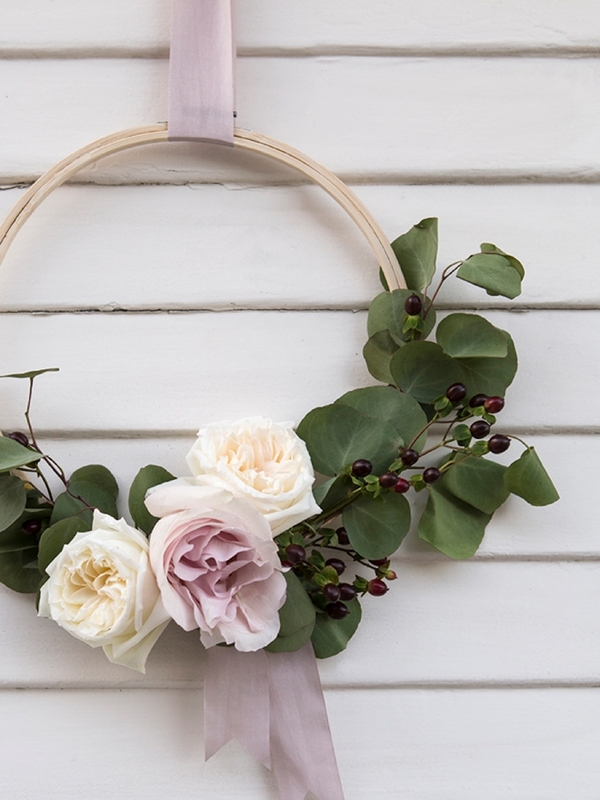 When you’re finished adding all the flowers cut off the excess wire. 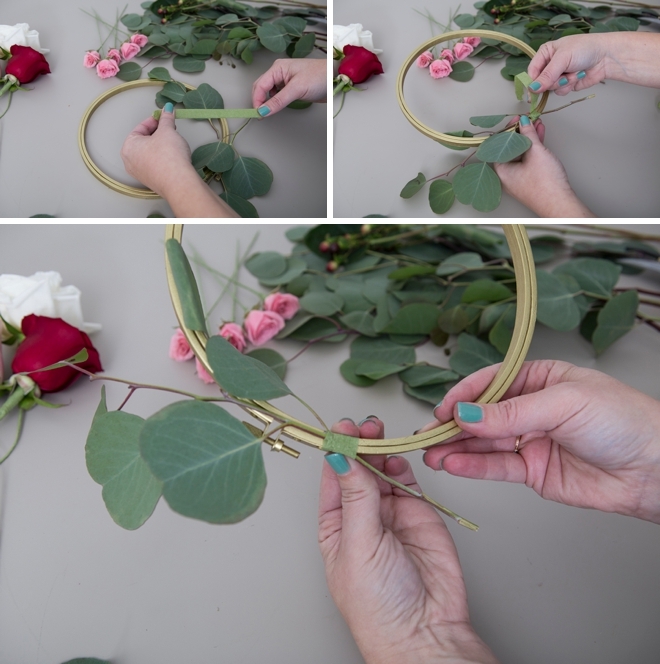 Since most of these hoops will be hanging flat against something like a wall or a door, it helps to design the hoop on a flat surface, but regularly hold it up to see what it will look like when it’s hanging. 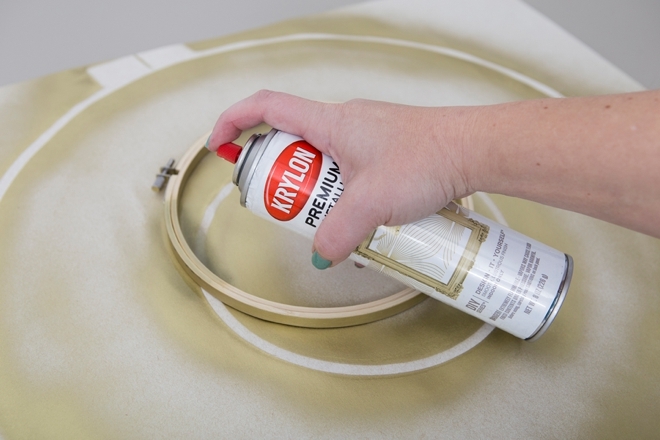 Crafters Tip: add a dab of vaseline to the inside of the cap once finished, so that the cap doesn’t get glued to the top of the tube! 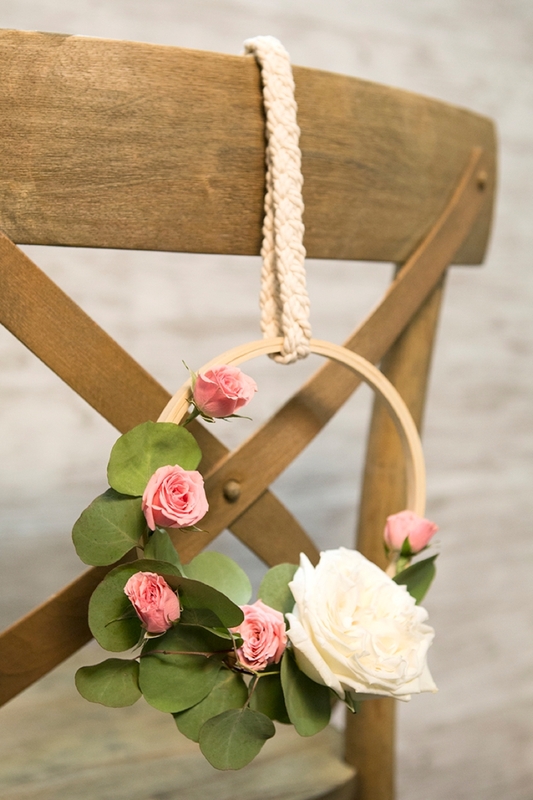 In just a few steps you can have the sweetest, unique floral decor for any special event! 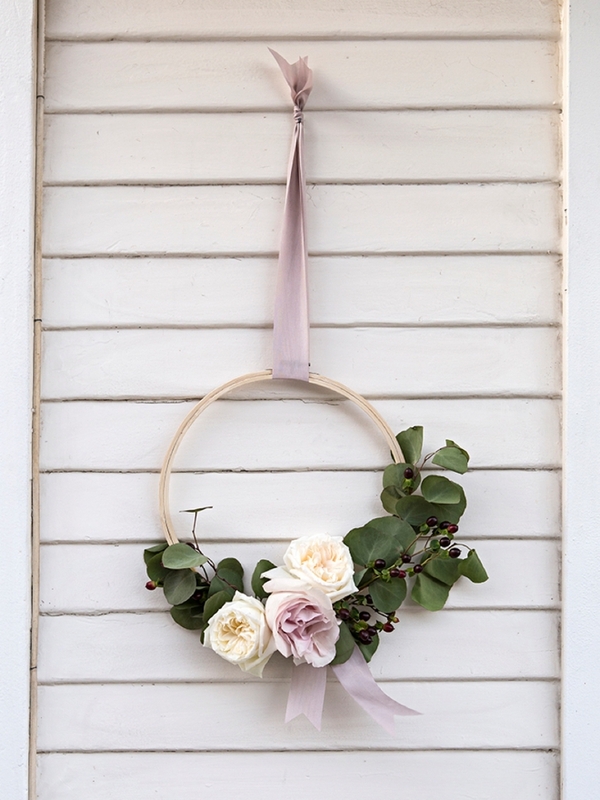 The last step is to hang these sweet hoops with your choice of ribbon. 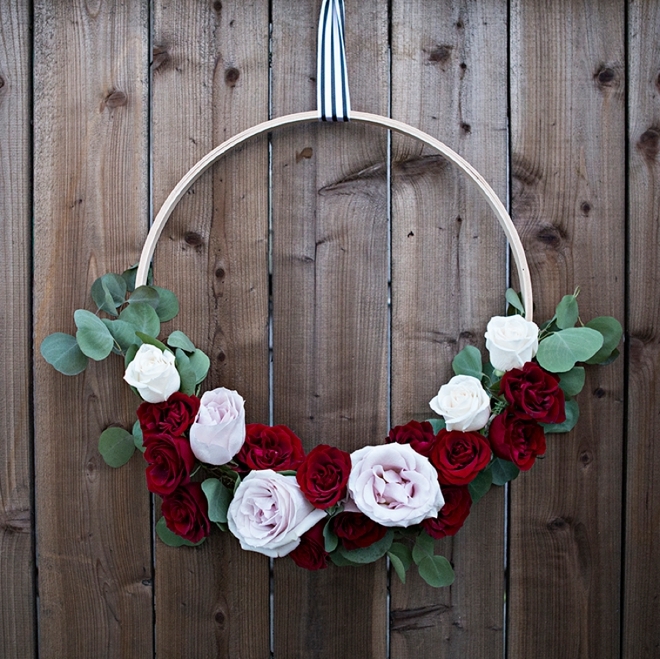 String through the hoops and hang wherever your heart desires! 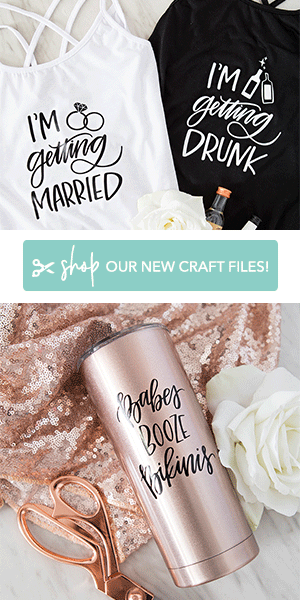 You can also add a bow or other elements to jazz up your hoops… potentially even laser cut bride + groom signs!